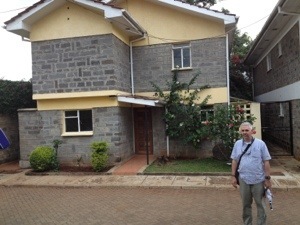 We celebrated our 20th wedding anniversary on Wednesday by finding a place to live here in Nairobi! Thanks to all of you for praying about this. It will be another ten days or so before we can move in but that should give us time to have some furniture made. It’s not fancy but its a nice place with good neighbors. Some of them are MAF (Missionary Aviation Fellowship) missionaries. The boys will have a good place to play outside and kids to play with. Also we can walk to a small grocery and bakery nearby and there is a good sized local fruit and veggie stand. We continue our Orientation with our SIM team next week. Everyone has been really helpful and encouraging and we feel right at home already. The kids are also doing GREAT -we know that so many people have been praying for them,and we can see the fruit of that -so don’t stop! Finally, please pray that we will locate three boxes of homeschool books that I (Stacey) mailed before we left the US. Unfortunately I put the street address and not our team’s post office address- a big mistake. So they are floating around out there somewhere:( Please pray that we locate them. I will post our mailing address soon. Thanks for many of you for asking for it. Thank you so much for taking the time to update us here! I check your site daily to see what in the Lord’s World you guys have been up to! Hey, Stacey, did you receive your books yet? If not, you can contact The Book Samaritan at http://www.thebooksamaritan.com. They provide books to home schoolers in need. I am glad you found a house! Praying for you! Thank you! Love you guys!! Will send more pics to you when we get better email connection. 20 years!! Amazing! Happy Anniversary – and congrats on finding what sounds like the perfect place! Love and miss all of you! DeAnna,we pray you and the little one are well! Looks better than the last place you were at. Praise God for what He is doing in and through you. Thank you for your prayers. Thank you for your support and friendship. We will be praying for you and the kids and homeschool book situation. When God moves, He moves in a quick fashion. Mark, what is your next step? When will you get out to see those in Sudan or the missionaries? I hope that things are going well. I believe that we have found a place to live in Juneau. It is a wonderful place that goes above and beyond our needs. We will know if we get it by the first of next week. As well, it looks like we tentatively have a renter for our house who is at Centerview Baptist Church and in my Sunday School class. I praise God for this opportunity. We are getting excited about going. You are such wonderful friends. Please pray for good family relations with my in laws and that I would have the love of Christ in me. We have benn on vcation together all week. We love you all. Thank you for being such wonderful friends. May God continue to fill you both with blessings and you continue to fill others. In Christ, Ray, Paula and family. We are still praying for y’all.